I have a small and carefully selected breeding program based on two dam-families, the celebrated Milordka-line through Saga and her Amurath Sahib-daughter Sakla and from the smaller but very distinguished dam-family of Szweykowska through the beautiful Comet-daughter Warmia. I bought my foundation mare Sapala (Cadyk x Saldara/Dardir) in 1991 and today I have her daughter Salaterka (by Elton) and granddaughter Silencia (by Ecaho x Salaterka) in my breeding program. In 2002 I had the fortune of requiring the yearling filly Wiona (Angor x Warszula/Palas) from Kullatorp Arabian Stud. 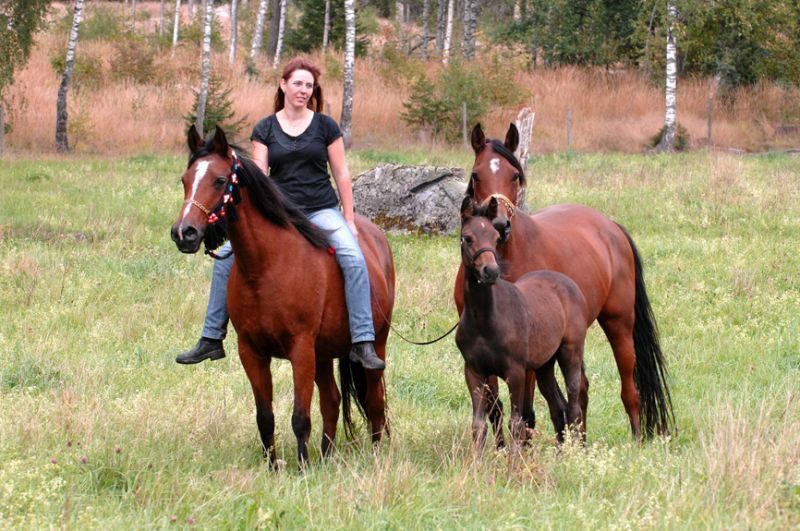 Wiona and her daughter Wiszula (by Ecaho) are part of my wonderful group of horses, although Wiona is currently leased out to Ewa Wendén in foal to her old stallion, the 1988 European Junior Champion Colt Glaz (Bomarc x Galaxcja/Aladdin). Unfortunately Ewa lost Glaz due to old age in February 2012 and Wiona will have the last foal by him in June.